1978 Bronzed Aussies/Cheyne Horan, 5ft 10"
FIN 9 1/2'' fin box/ no fin. 1. Cheyne Horan Design - text in black Circle/star at nose. 2. Bronzed Aussies - Largescript and Australian flag/Wave logo at sweet spot. Deck: 9777 pencil on stringer, rear from centre. Purchased 8 December 1999 LineUp Surf Shop 128 The Stand, Dee Why, Sydney NSW. One of several boards shaped by Terry Bishop at Gordon and Smith Surfboards for Cheyne Horan as a member of the Bronzed Aussies. Breaking a longstanding relationship with McCoy Surfboards, Cheyne Horan would return there within a year. 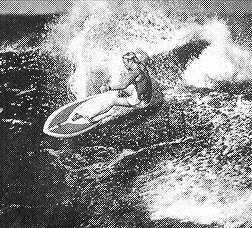 Cassidy : Greats of Australian Surf pages 32 -36. 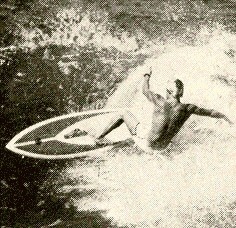 Drew Kampion : Profile : Cheyne Horan in Surfing magazine Vol 17 # 7 March 1981 pages 56 - 65. 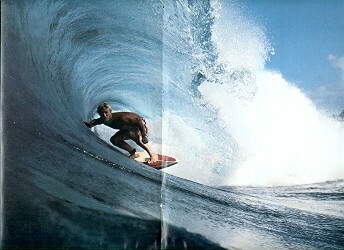 Ross Myers: 1979 Bells contest, won by PT, also Cheyne Horan. Surfing magazine Vol 15 No 7 page 8.